Chandigarh November 23, 2018. Sh. Satya Pal Jain, Additional Solicitor General of India, Ex- Member of Law Commission and Former City MP, today said that the Government of India has appointed 126 Advocates as Senior Panel Counsels and Central Government Counsels for contesting the cases of the Government of India in the Punjab & Haryana High Court. Giving this information, Sh. Jain said that these counsels shall be conducting the litigation of the Central Government (except cases of Railways and Taxation) in the Punjab & Haryana High Court. These appointments will be valid for three years. These lawyers shall be entitled to the fees for conducting the cases of Government of India from different Departments as per the rate fixed by the Government of India in 2015. 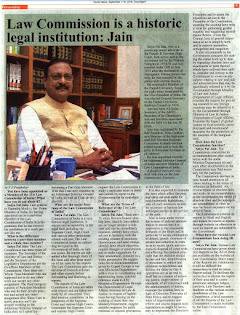 Mr. Jain said that the lawyers include 58 Senior Panel Counsels and 68 Central Government Counsels. All the Counsels appointed as Senior Panel Counsels are having minimum 10 years practice. Out of the 126 appointments, 59 are new appointments. He also said that it is for the first time that as many as 20 women advocates have been appointed on the Central Government panel. It may be mentioned here that Sh. Satya Pal Jain, Additional Solicitor General of India is the Litigation Incharge for all cases of the Central Government Counsel in the Punjab & Haryana High Court and he is responsible for distribution and allotment of cases amongst the panel of Government of India, comprising of Asst. SG, Senior Panel Counsels and Central Government Counsels working under him. With these appointments, the total number of Counsels working under him on the panel of Government of India has gone up to 135 counsels (including Asst. SG, 63 Senior Panel Counsels and 71 Central Government Counsels). Senior Panel Counsels – Ajay Kumar Gupta, Alok K Jain, Amit Arora, Anil Chawla, Mrs. Anita Balyan, Ankur Sharma, Arun Gosain, Arvind Moudgil, Ashish Rawal, Ashok Kumar Arora, Ashwini Kumar Bansal, Mrs. Balwinder Kaur, Bharat Bhushan Sharma, D.P. 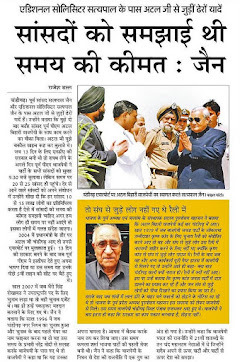 Gupta, Daya Krishan Wadhawan, Dharmender, Dheeraj Jain, Ms. Gurmeet Kaur Gill, Harpal S. Baidwan, Jatinder Nara, Lokesh Narang, Namit Kumar, Narender K. Vashishth, Nikhil Kumar Chopra, O.P. 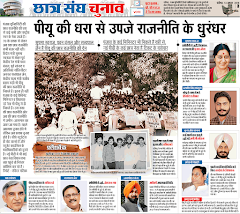 Dabla, Pankaj Gupta, Pankaj Jain, Parminder Kanwar, Parveen Hans, Parvesh Kumar Saini, Parveshinder S. Sidhu, Pawan K. Longia, Piyush Bansal, Praveen Chander Goyal, Ms. Puneeta Sethi, Rajender Singh Malik, Rajesh K. Sharma, Rajiv Kawatra, Rajiv Sharma, Rajiv Singh Sihag, Ramesh Chand Sharma, Ms. Ranjana Shahi, Rattan S. Longia, Roopam K. Jain, Ms. Sangeeta Tiwari, Sanjay Vashishth, Mrs. Sharmila Sharma, Mrs. Sheenu Sura, Shiv Kumar Sharma, Shivoy Dhir, Somesh Gupta, Sudhir Nar, Sunil K. Sharma, Surinder Mahajan, Vijay Kumar Chaudhary, Vipul Aggarwal, Vishal Gupta, Vivek Chauhan. Central Government Counsels ­– Aayush Arora, Abhinav Gupta, Aditya Jain, Aditya Sanghi, Agam Jund, Ajay Kalra, Ms. Alisha Arora, Amit Kumar Goyal, Amit Sharma, Amit Sheoran, Ms. Amrita Singh, Ms. Anju Rathore, Anoop Kumar, Arihant Goyal, Arvind Seth, Aseem Aggarwal, Ashish Aggarwal, Baljinder Singh Inchhewal, Bhupeshwar Jaswal, Bhuwan Vats, Brijeshwar Singh Kanwar, Chandan Gaddi, Deepak Malhotra, Deepak Nayar, Gagandeep Singh Simble, Gaurav Pathak, Gautam Mittal, Ms. Geeta Sharma, Ms. Gehna Vaishnavi, Harneet Singh Oberoi, Jatinder Pal Singh, Karan Bhardwaj, Karan Kumar Jund, Kartik Gupta, Krishan Kumar Chahal, Kushagra Mahajan, Manish Dadwal, Ms. Mansi Bansal, Mrs. Monica Chawla, Ms. Neha Sharma, Nimerpreet S. Sidhu, Pankaj Mulwani, Prateek Gupta, Prateek Mahajan, Pritpal Singh Miglani, Rajiv Verma, Rajneesh Kumar Shelly, Mrs. Rajni Narula, Randhir Bawa, Rohit Verma, Ms. Saigeeta Srivastava, Sandeep Bhatia, Satish Singla, Saurabh Goel, Saurabh Mago, Shobit Phutela, Ms. Shweta Nahata, Mrs. Sonia Sharma, Ms. Tanvi Jain, Udit Garg, Umesh P. Wadhwani, Vaneet Mittal, Varinder Singh Chandhok, Varun Issar, Vikrant Pamboo, Vineet Kumar, Vinok K. Kaushal, Yatin Gupta.